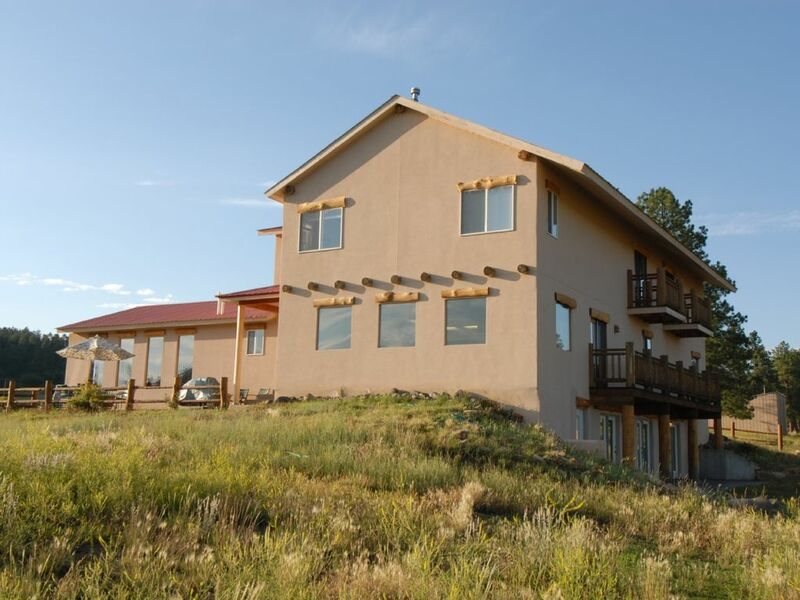 Piedra Pines Lodge is located 4 miles NW of Pagosa Springs, CO. Our large, comfortable lodging provides 7,000 square feet of Santa Fe style living. The lodge is located on 11 acres off of Co. Rd. 600 with a full view of the San Juan Mountains from every window, and backs up to a National Forest. With these mountain views, Piedra Pines is wonderful for family reunions, church groups, cooperate retreats, hunting and fishing parties and even perfect for small weddings using the mountain as their perfect backdrop. Sports enthusiast will enjoy Wolf Creek Ski Resort which receives the most snow in the continental U.S. and Pagosa Springs 27 hole championship golf course. Some of the most interesting tourist sites in the U.S. are located in this area . . .Cliff Dwellings. . .Chimney Rock . . .Hot Springs. . .Treasurer and Pagosa Falls. . . Williams Lake. . .Durango-Silverton Railroad, to name a few. 3 Fireplaces, 2 Refrigerators, Large patio with fabulous mountain view, 11 acres to ride recreational vihicles and large game room. Very accommodating, enjoyed the home and well maintained. Thank you! Thank you for your positive review. Please come back for another visit some time. We would love having you as our guests. The house was perfect for our large group! Our large group (7 families!) loved staying at this home. The views were spectacular and the children had fun exploring/playing on the property. We had ample space for everyone to spread out. The kitchen was a bit small for the amount of food we had to prepare, but we made it work. All-in-all, we would definitely stay here again! We stayed at Piedra Pines lodge for our family reunion, and it was perfect. Each of the 7 bedrooms has a full bathroom en suite, and there is also a full bathroom near the bunk room on the lower level and two half baths on the main level. The house was equipped with everything we needed. The manager promptly responded and was very accommodating. The whole family was in favor of booking again for our next family reunion. Thank you for the lovely review. We do hope you choose us for your next reunion. This house was going to be a ( bed and breakfast) by the previous owners so there is plenty of room for everyone! Our family chose this 8 bedroom home for our vacation in colorado. We had a great time in colorado. The best part of our vacation was to be able to stay all together under one roof. The home was great and Christine (the overseer) was there promptly if we had a problem or questions. Loved the house and thanks to the Coder family for sharing it with us. I recommend this house to anyone with a large family who travel together. Thanks so much. They really took such great care of our place and cleaned up before leaving! Hope they come back sometime! Wonderful house! All bedrooms were very spacious; 2 separate living room areas; 2 separate patios. Wheelchair accessibility was great. Secluded area, but still only 4 miles from the Pagosa Springs main road. Perfect house for a large group!